Friday 29th Ralph was being really nice to me tonight and I was making an effort not to be my usual sarcastic self. I think I managed quite well actually. We got the bus to the cinema and we were both feeling travel sick. He was asking loads of questions about Pembrokeshire but I think it was just to make conversation. We gave them their pressies (a can of Welsh ale) at Emma’s house. He was dead pleased I’d got him something I think. 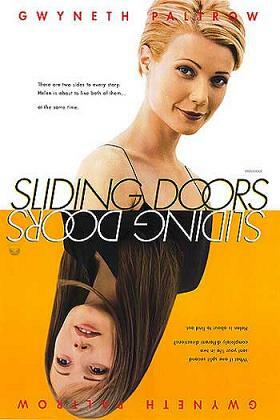 At one point in the film, Gwyneth Paltrow has her hair shorter and stuck up in flowers on top of her head. Ralph started saying, “That looks really nice. I reckon you should have yours done like that with flowers.” [Flowers and sportswear – a winning look, I’m sure.] I couldn’t stop smiling. I dunno what made him say that but I thought it was sweet for some reason. On the bus my wallet had fallen out of my pocket and I was panicking because I didn’t notice until I was off it. Ralph was being really sympathetic and kept asking me if I was alright and telling me not to worry. I think he was probably just trying to get on the right side of me but, I have to say, it worked a bit. At McDonald’s, Ralph was messing about with the umbrella on the table and it dropped down and smacked me on the head. He kept apologising and asking if I was okay. Usually he’d have laughed probably. When we were walking back to the bus stop, he asked me where I was going from Warrington Bus Station. I said I was staying on and going him. He sounded dead disappointed and Emma didn’t really want to be left with the lads so I said I’d get off and stay at Emma’s for a bit. Then Emma and Freddie dropped back so I started telling him what I could die of (like food poisoning from eating a mouldy Crème Egg) then he asked me what I thought about when I stared into space. I told him I was worrying about where my money was but he asked me what other things. I think he wanted me to say him but I didn’t. Either that or he wanted me to ask him the same question. We got the bus back from Warrington and then Freddie rang his mum for a lift. We had to meet her by the station so we all went and sat on the wall. Emma and Freddie sat with each other so I went and sat by Ralph. We started talking about pubs and which ones were near us and which ones he could get served in. Then this girl walked by with a long skirt on with big slits up either side. Ralph said, “That’s a really nice skirt. I think you should get one like that.” Hmmm, I wonder why. I wouldn’t be the fact that you could virtually see her knickers, would it?! When Freddie’s mum arrived I was a bit stuck as it was a high wall and I didn’t want to damage my knees even more by jumping off it. Just as I did, Ralph tutted and said, “I was gonna catch you then.” Damn it, I should have waited! As we were getting in the car, Emma decided to push her way into the middle so she was between me and Ralph. He did ask her why she’d done that. Then he started talking about this 10 year old girl who wanted to marry him and I went, “She’d better keep her hands off!” He said, “What did you say?” I know he heard coz he was smiling too much. I meant it too! At some point he started saying to Emma, “Ferny never did fancy Tess, I mean, Hayley, he just wanted a girlfriend. You see, I’ve got Tess on the brain. I wake up in a cold sweat in the middle of the night just thinking about her.” Aaah, sweet. [Urgh, gross. Also, isn’t a cold sweat a bad thing?] If he keeps all this up, he’s definitely going to get somewhere! Saturday 30th I got my wallet back. Some woman found it and contacted us though BT which was from my Chargecard. I collected it from her house today. Ralph and Freddie are round at Emma’s house. I could probably be too but I didn’t really want to coz they’ll probably be getting pissed and go all stupid.